Phone: Please email for accuracy. for comparison. We have the best comments in the whole building. tiles were laid down throughout the condo with granite countertops. leather sofa and chair. Even the wall switches have been replaced. The kitchen is furnished with stainless steel appliances. and decoration of this unit. Look for us on for more photos. furnishing, Free Internet in the condo and much more. $1.50/load. Dryer $1/30 min or $2/60 min. v Trash room is 2 doors down to your right. 7 am - 10 pm. stocks all sorts of supplies and foods. v Internet room with computer stations on the first floor. per minute. $0.35 per printed page. v FREE high speed internet in our condo. Bring your own RJ45 cable. v Two jet Jacuzzis, one hot the other hotter. office on the other side of the first floor lobby. some cook to order Hawaiian plate lunches (including meats and fish). v 10 Electrical BBQs. Coin operated $2/hr. until Video 2. Also works for CD music and MP3s on a CD. v Local telephone calls free. Toll restriction on the phone. limitations. Payphones are available on the 1st floor. to 72 and fan speed to F1. v Extra set of sheets and towels are in the closet. call our caretaker and arrange directly and pay directly. v Food Pantry Supermarket on Kuhio. v ABC stores on almost every other corner. at Pacific Beach Resort one block away. Large aquarium restaurant. Even if you don't eat there, walk by and have a look. v Aquarium, Zoo, Beaches and Parks. free Hawaiian cultural events close by. 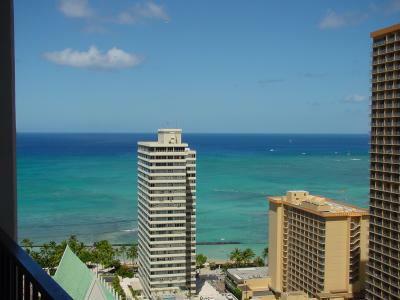 in Waikiki, on the zoo side, near all the luxury hotels. best beaches 1 block away. 11.42% HI State Tax  additional to all charges. SENIORS 55+ Receives $11 off per day. Longer terms please ask. Discounts applicable.